Welcome to the sixth edition of the Carnival of Divided Government - the special Election Eve Edition. As explained previously, we have adopted Latin ordinal numeration, in order to impart a patina of gravitas reflecting the monumental importance of the series. In Carnival of Divided Government Sextus, like in every edition, we select volunteers and draftees from both the blogosphere and main stream media on the singular topic of government divided between the major parties. In past editions, we have started the carnival with a survey of mainstream media selections, but on the eve of the one and only day when the Voice of the People is actually listened to by politicians, this - the People's Carnival, will begin with the most democratic of publishing media - the blogs. "Divided government by its very nature acts as an extra check in the checks-and-balances system, and in these hyper-partisan times, it seems to be the most effective. It forces consensus government from the middle. It forces compromise and policies that have a greater chance of working while having the added benefit of really torquing off a lot of powerful people." "I just found a whole blog dedicated to divided government: Divided We Stand, United We Fall, which just goes to show that there really is a blog for every purpose under heaven…"
The meme is peaking at just the right time. Now, I'm not taking credit for this, but I do think this blog was a contributing factor in promoting divided government as a voting strategy. When I started this blog, I had to dig through years of blogospheric history to find useable references to divided government. Now, six months later, I cannot keep up with the references on a week to week basis. "Unlike the radio "conservatives" who would polarize America and demonize all but their most sheepish followers as "Democrats, liberals, or RINO's", principled conservatives now recognize that the core values which the authoritarian GOP has abandoned (individual liberty, fiscal responsibility, the rule of law, prudent foreign policy) are more important than partisan victory." It is a great piece and there is a lot more there to chew on. Check it out. One-party rule, by contrast, impelled the Republicans to govern from the center of their party, instead of the center of the country. It made them dependent on their base, magnifying the power of partisans and extremists. On Capitol Hill, meanwhile, governing with a narrow majority has required the Republicans to protect every GOP incumbent and scrounge every GOP vote, forcing them to pander every which way (see: horse meat). The result is the dysfunctional mixture of partisan extremism and philosophical incoherence that has characterized the party for the last four years. The Republicans lost their way because they won control. " Another indicator of success, is when the opposition takes notice. Not all, but much of the oppostion comes from the "party before principle" partisans on the right. Examples include Hard Starboard, Bits Blog, Soccer Dad. Their arguments rely on Democratic party stereotyping or outright invective. They do not address the fundamental factual basis of William Niskanen's (et.al.) work. CALLER: It's an honor and a privilege to speak with you today especially right before this very important election. CALLER: I have tried to explain this to friends and coworkers. I grew up in Ohio, but I also lived in Florida for about six years, and framingly [sic] enough I've heard from several different people the concept of, well, regardless of who is in charge of White House, whether it be a Democrat or Republican, that they chose to vote the opposite party into power in the House of Representatives for a checks and balances, without realizing that there's already checks and balances in place, so I thought maybe if it was coming from you it might be a little bit more persuasive to say, "Don't do that, it's not very smart." RUSH: Well, see, I understand that sentiment. I don't think there are that many people out there. The media has put that notion out there, and they've done it for a number years. They tried it in 2002 and 2004 in the sense it would be good. "We have one-party rule. Why, that leads to corruption and leads to people becoming out of touch in Washington." They love one-party rule when it's them. The only reason they're against one-party rule is because they're not the party, and so they're trying to say it leads to all kinds of bad things. But that means they don't trust the democratic process. The democratic process delivers what it delivers, and if it delivers a Republican dominated House and Senate and a Republican president, then that's representative democracy at work. That is what you get in a representative republic, and to sit there and complain about it is to complain about the system itself. I'll tell you what, Sean. I do not believe that Joe Six-Pack voter or Susie six-pack voter, when they walk into the voting booth says, especially in a congressional election, "We've got President Bush. I think we need Democrats to counter it," especially Republican voters. If Republican voters don't vote Republican this year, it has nothing to do with wanting divided government or checks and balances. That's not how people think when they vote. There may be some nabobs that do that, but it's such a small number as to be inconsequential." That was about as coherent as it got. From there, Rush went off on a tangent ranting about Liberals targeting Wallmart and big drug companies that had absolutely nothing to do with the caller's question. I guess we'll find out tomorrow how many "nabobs" are voting for divided government. This is an example of what I have started calling: "the intellectual bankruptcy of the right." Back to the world of rational discourse. We found a couple of blogging economists weighing in on divided government. "I had the pleasure to work as a CEA staff member in 1982-83, when Bill was one of the three members of the Council. (Marty Feldstein was chairman. The staff at the time included two other well-known Reaganites--Larry Summers and Paul Krugman.)" "Finally, perhaps the lens of "left" versus "right" is not the most important factor in these midterm elections. Rather, we are facing the choice of unified versus divided government. In this context, the question is whether a Democratic House is likely to impede good government or provide a useful check on bad government.?" "Midterm loss, however, could be a good thing for the Republicans going forward. Having a Democratic leadership in Congress will be a useful rhetorical foil for the president, and divided government will force Democrats to shoulder some of the blame for the continuation of unpopular policies–particularly if prominent Democrats are unable to follow through on their commitments to force troop withdrawals from Iraq and Afghanistan." Um - Chris. I have yet to hear any Democrat call for withdrawals from Afganistan. If anything, they are calling to pull troops from Iraq and move them to Afganistan. Andrew Sullivan got in the best line of the week yesterday when he said "This is not an election, this is an intervention" on Chris Matthews Sunday show. He has become a true believer preaching that divided government is the path for conservatives to save their souls. Here - two recent posts on his blog: "Divide and Govern" and "Divide and Govern II". More blogs joining the deafening divided drumbeat include: Political Bloviation, Buffalo Pundit, Its My Mind, Battlepanda, Conservative Democrat, The Political Spectrum, Right Side of the Rainbow, and more that I just cannot get to now. There are still two important MSM contributions before we wrap up. "For the rest of us, one thing above all seems crystal clear this election. We should probably never again give one party all the keys to the kingdom. Not the Republicans. And not the Democrats. Not at any level. People in power simply can’t be trusted. If we’re going to have a Republican executive branch, we need a Democratic legislature to hold its feet to the fire. And vice-versa. So on Tuesday, I’m neither voting Democratic or Republican. I’m voting for the oldest party in the republic. Its name never appears on the ballot, but it’s always there and it has always served us well. 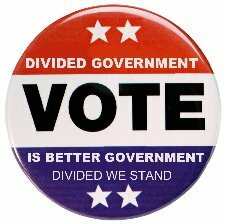 Divided government." In short, when I vote Democratic next week for the first time in my life, what I am really voting for is gridlock. I am not voting for the Democratic Party's policies, most of which I still oppose. Rather, I am voting for change, congressional oversight and White House accountability. I am voting against Republican corruption and out-of-control spending. If that takes putting Democrats in charge of Congress, then so be it." Indeed. So be it. Starting Wednesday, let us see if we can begin to fix the Republican Party for 2008. That concludes this edition. Since it was the Election Edition, we dropped the tradition of including one "off topic" submission, but will restore that tradition in the next round-up. Thanks for stopping by, and thanks for all of the submissions. The next edition of the Carnival of Divided Government will be our Special Turkey Edition, and will be posted, sometime before 11:59 PM PST on Wednesday November 22. Submit your blog article at carnival of divided government using our carnival submission form. Past posts and future hosts can be found on our blog carnival index page. 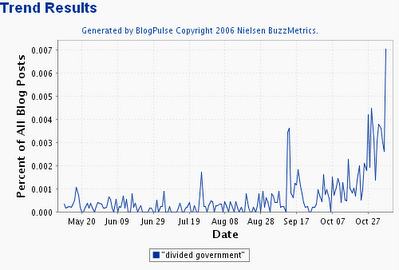 Technorati tags: divided government, conservative, libertarian, 2006 election.